Tamara Frankel teaches Jewish studies and coordinates the Tefillah program at Rochelle Zell Jewish High School in suburban Chicago. Over the last six years, Tamara has become particularly interested in the relationship between text study and social emotional learning in day schools. She is currently a doctoral student at The Davidson School of Jewish Education at the Jewish Theological Seminary. She is also a graduate of the Pardes Educators Program and York University in Toronto, Canada. Tamara Frankel underscores the need for setting goals in tefillah education. As early as the time of the Bible, Jewish prayer has been directed. When Moses seeks God’s healing, he directs it toward Miriam (Numbers 12:15). In the fifth chapter of Berakhot (5:1) the mishnah describes the custom to wait one hour before praying in order “direct” one’s heart to God. This is one of many sources where the term kavvanah (direction, intention, meaning) in tefillah emerges. The Rabbis understood the need to give us direction in our prayer life; they recognized that one wants to pray sometimes yet ought to pray always. As in all good teaching, there need to be clear goals. Since tefillah is part of the school day, it requires our pedagogic attention. 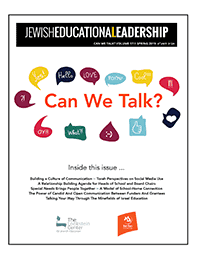 Working toward a coherent vision for tefillah that speaks to teachers, students and the larger educational mission of a school will naturally improve Jewish prayer experiences in day schools. For two consecutive summers, the Pardes Center for Jewish Education ran conferences entitled Aleinu LeShabe’ach which aimed to bring together tefillah educators from a range of North American day schools and train them to plan and execute such curriculum. While the conferences built a network of tefillah educators, a shared sense of purpose and support for one another, it primarily underscored to me the importance of goal setting in tefillah. If we want to create powerful prayer experiences for our communities, we need direction. How do we find our focus in tefillah education? First, we look inward. Then, we pan wide and consider the vision of tefillah in our schools and how that speaks to the broader mission of our institutions. Given the range of ideological philosophies of our day schools, tefillah too will look different in each one; and as such, each school community must undergo this internal introspection. To begin, each educator must reflect on one’s personal experience with tefillah, identifying moments of connection and disconnection from tefillah over the course of one’s lifetime. The framing question for this exercise at Aleinu LeShabe’ach was: Who am I as a pray-er, a mitpallel? This reflection gives voice to Parker Palmer’s notion that “as I teach, I project the condition of my soul onto my students, my subject and our way of being together” (Palmer, 2007, p. 3). One cannot be an effective educator if one does not take stock of one’s own experiences and biases, and this is no less true for teachers of tefillah than of any other subject matter. Once one articulates how she feels personally vis-à-vis tefillah, she is ready to zoom out and contemplate goals for tefillah education for an entire school. At the conference, we returned to goal-setting by hearkening back to the pedagogies of Jay McTighe and Grant Wiggins (2005), namely their notions of Understanding by Design. Before lesson planning of any kind, these educational theorists note that a teacher must decide where she wants her students to be at the end of a unit, a semester, one’s day school education, and work backward from that endpoint, planning constantly with that goal in mind. Tefillah educators must ask the same question posed by McTighe and Wiggins: “To what ends is the teaching directed”? Aleinu LeShabe’ach offered teachers possible goals and orientations to consider for their own classrooms and schools with regard to tefillah. These suggested goals include tefillah as a mode for character refinement; tefillah as a tool for community building; tefillah as a laboratory for developing one’s relationship with the divine. Jewish educators need to imagine how these goals for the tefillah curriculum fit into the larger mission of one’s day school. This echoes the educational theory of Joseph Schwab’s (1978) commonplaces. Schwab asserts that educators must consider the teacher, the student, the subject matter and the milieu in order to craft coherent and thoughtful curriculum (Roby IV, 2014). First, teachers must engage close examination of the subject matter, and in the case of tefillah education this involves careful study of the texts and history of Jewish prayer. Literacy plays a critical role in unlocking the power of tefillah to refine one’s character, build community and connect with God. Aleinu LeShabe’ach also reminded teachers of their personal and institutional goals for tefillah and how to use these goals as their compass in tefillah programming. All teachers of tefillah need greater clarity. One needs to open a larger conversation with key constituents, such as other teachers and administrators, in some cases parents and lay leaders, about the goals of tefillah in a day school. Jewish educators need to imagine how these goals for the tefillah curriculum fit into the larger mission of one’s day school. As Amy Ricketts articulates, “commonly, stakeholders gather to make curriculum decisions, but the desires and voices of some dominate over others” and thus, the role of the curriculum designer is to be the peacemaker between all parties involved” (Ricketts, 2013, p. 34). In a sense, the person or group that develops the curriculum must negotiate the competing needs of the other commonplaces: the teacher, the student, the subject matter and the milieu. To address this need for balance, Aleinu LeShabe’ach asked each teacher to take on one of the goals suggested earlier and create a lesson plan with that goal in mind. 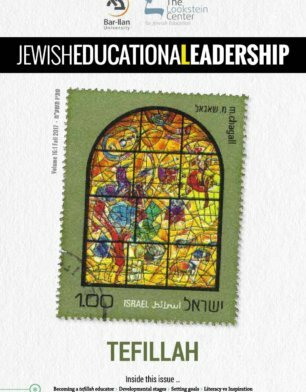 In this exercise, a teacher initially and continually asks: What am I trying to achieve in tefillah education? How does this goal account for the needs of the teacher and of the student? Which texts or ideas best communicate this orientation to tefillah? What setup of the physical space of the room and student involvement are necessary to teach toward this goal in the lesson? These questions allow the teacher to continually sharpen his goal for tefillah in this particular meeting, in a unit of study, over the course of a school year. In this way, teachers use Schwab’s commonplaces to sharpen their “big ideas” for tefillah education. Aleinu LeShabe’ach affirmed that partnership between the teacher, the student, the subject matter and the milieu as well as their ongoing dialogue with the goals of tefillah education are vital to the success of any such curriculum. Giving significant time and forethought to the purposes of tefillah both personally and professionally is fundamental to the effectiveness of this domain of Jewish education. If we want to find meaning in tefillah and draw strength from our prayer experiences and communities, we need to give them direction. McTighe, J., and Wiggins, G. (2005). Understanding by Design. Association for Supervision and Curriculum Development. Palmer, P. (2007). The courage to teach. San Francisco: Jossey-Bass. Schwab, J. (1978). Eros and Education. Science, Curriculum and Liberal Education: Selected Essays.